Upgrades are part of daily life for WordPress users, usual routine everybody’s got used to and doesn’t t make any fuss of. However what concerns updating store on WooCommerce, WordPress eCommerce plugin, the issue’s a bit more complicated as requires data export from the outdated store version into more relevant and enhanced one. Is upgrading so inevitable? Why should you even bother? And, once you decide it is something your business needs - how to update WooCommerce store smoothly? How to avoid the common mistakes WordPress forums yell about? These are the questions we’ll cover in this article. Stay tuned! WooCommerce has open-source architecture. Thus, you have to understand that its source code is constantly evolving. The bugs are fixed and improvements introduced. Technology changes with the light speed and to remain relevant open-source eCommerce solutions keep releasing new versions on temporary basis. Upgraded version will ensure that you have the most enhanced functionality to manage online business. You are well aware how highly competitive modern eCommerce world nowadays is. Every minute 571 websites are created worldwide. The flow of information is HUGE. The number of online stores offering the same type of products or services you do increases with every second. To remain afloat, your online store has to provide features your business opponents have. The scenario will be much more promising once your website would suggest features your competitors don't. If to consider the fact that usually the list of features in a new version includes website speed and SEO improvements. Upgrading WooCommerce seems even more reasonable. Security is a crucial aspect for any website owner and online shops are not an exception. Security updates that are introduced within each new WooCommerce version are crucial to guarantee your data and business, in general, are safe. To put it short: If you want to maintain functional, fast and secure online store on WooCommerce - upgrading is essential. CRUD is an abbreviation for the four basic operations you perform with the database of an e-store: Create, Read, Update, and Delete. In 3.0 WooCommerce version, another layer between database and the code is introduced that adds structure, validation, and control. Gallery behavior has now become more intuitive. Your clients will have both the access to magnification and zooming (lightbox). They will be able to swipe to scroll through the gallery, pinch to zoom, swipe up to close it. Once the product gallery is opened on mobile, the image will be displayed in it’s true size, larger than the in-page display. In WooCommerce 3.0 version a new CLI (Command Line Interface) was created that directly integrates with the REST API and supports its functionality. A new version of the API with a couple of benefits over v1 was introduced. New taxonomy under the name tag product_visibility is implemented. There is no “order items” column on the orders page. Variable product synchronization is optimized. WP_Query from up-sells.php and related.php have been removed and substituted with PHP for each loop. A delayed CRON event to send the emails instead. Updated logging system includes 2 log handlers - file and database and is much more extensive. New logger comprisez log handlers and uses the methods described by the PSR-3 logger interface. What are the most common issues WooCommerce users face after the online store upgrade? 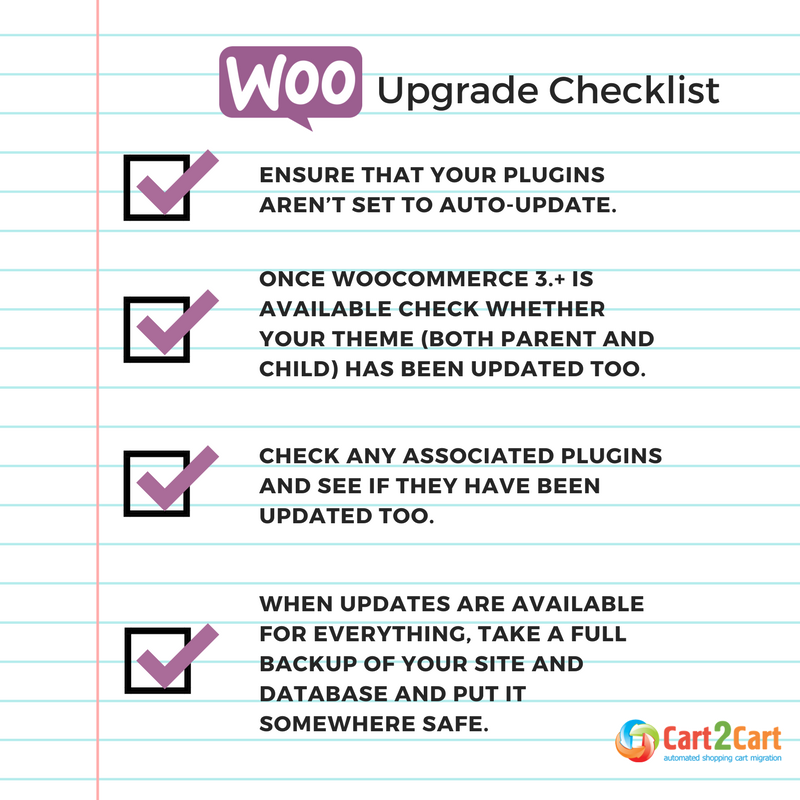 First of all, once you decide on WooCommerce Upgrade to 3.0 or any other 3.+ version you have to make sure the theme you have installed will be compatible with the new version. The same thing is with other plugins you use. Upgrading e-store is a significant step that will boost your business, yet it requires a bit of planning and checking the compatibility of all the previously installed features. The most significant thing we advise you to do - make Woo store backup. It will help you uncover a plugin conflict in case any occurs and find out what doesn’t function properly after the upgrade. Inquire whether your web hosting provider offers automated backups or try free plugin UpdraftPlus, for example, to secure your website data. Crossing your fingers and hoping for the best is unreasonable. Use the short checklist below to overcome the major WooCommerce upgrade challenges and avoid any mismatches. Being Woo user for a while, you would agree that launching and managing online shop based on this solution is the pleasure. At Cart2Cart, we continue this enjoyable tradition turning store upgrade into an inspiring time for the online retailers. If anyone tells you it is possible to upgrade Woo store smoothly, avoiding data loss and duplication, would you believe? In fact, the procedure of updating store on WooCommerce is a complicated process of WooCommerce to WooCommerce export/import. Once the process of data migration is automated, WooCommerce upgrade becomes much simplified. Why upgrade WooCommerce via Cart2Cart? First of all, launching data transfer requires no particular tech knowledge and includes a couple of simple steps. Secondly, your current store performance wouldn’t be affected by the upgrade. It will remain up and running, fully available for your customers. Thirdly, Cart2Cart offers flexible pricing policy. You will be charged only for those entities you transfer and additional options you might choose to enhance your WooCommerce upgrade. Get approximate price for the automated update. Key advantage - perform Free Demo to check the service quality in advance. The procedure of setting the automated upgrade itself is fairly simple and consists of 5 steps. Cart2Cart Support team is available 24,7 via email, phone, and live chat to assist you on every stage. Use a valid email address or sign in using your Google+ or Facebook profiles. Choose WooCommerce as your Source Cart and provide your Source Store URL. To set up the connection between the two versions, download the Connection Bridge, unzip it and upload to your Source Cart root folder. 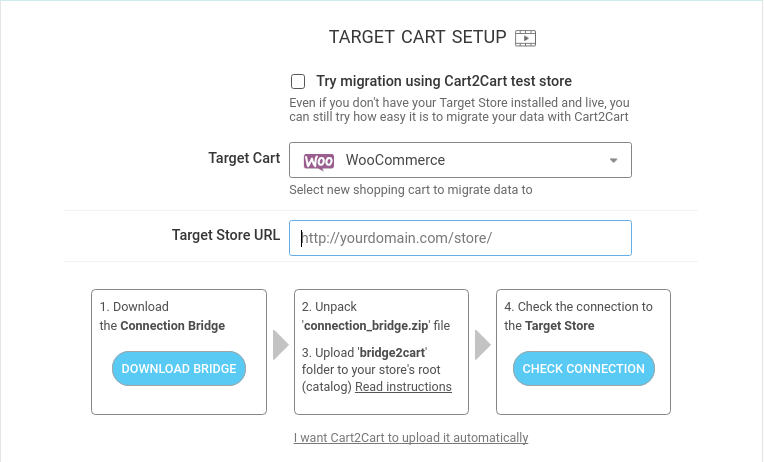 Select WooCommerce as your Target Cart and provide its URL. 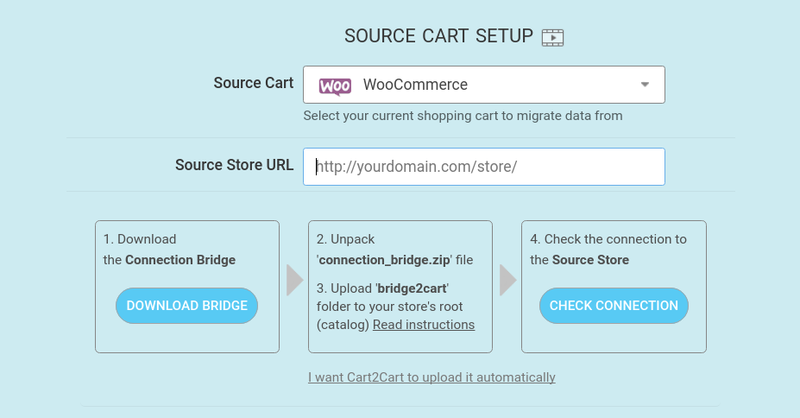 Download the Connection Bridge, unzip it and upload it to the updated WooCommerce store root folder. From the drop-down list offered, choose the entities that you would like to transfer. At this stage, you will also be able to choose additional options to enlarge the possibilities of the automatic update. 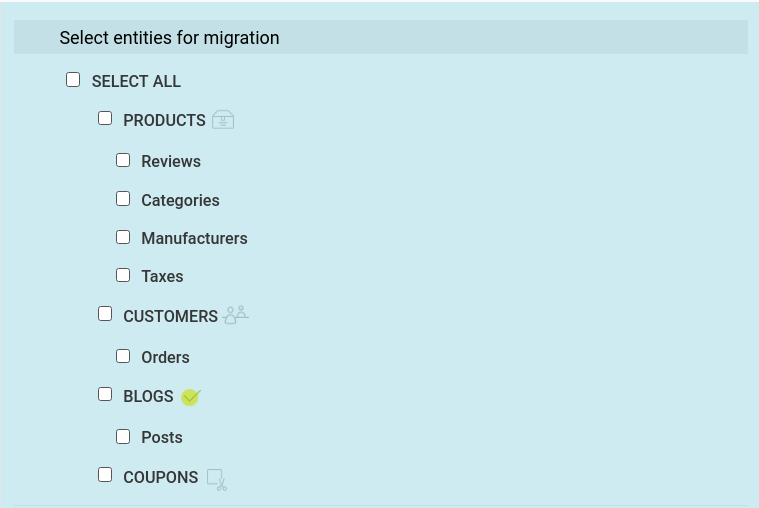 Some of the options are recommended to migration from and to particular shopping carts. With the case of WooCommerce upgrade, the service suggests you the functionality - “Migrate customers’ passwords”. It will save your visitors much time recovering old passwords and make clients much happier. You can try out all of additional features for free during Demo Upgrade to evaluate their benefits beforehand. All the required settings are done, you can press “Start Demo Migration” button. Within half an hour the limited amount of eCommerce entities will be transferred to the store on updated WooCommerce version. Once your Demo Upgrade is completed, you’ll receive the full report of the entities migrated. Check data transfer results and contact Cart2Cart Support once any issue remains unclear. 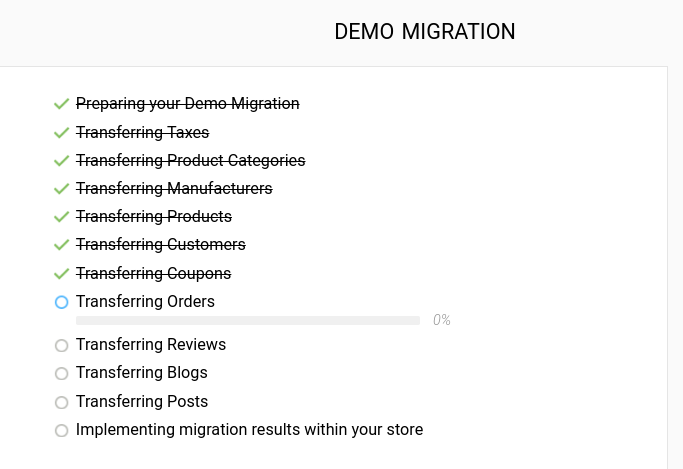 If you are satisfied with Demo Transfer, you can launch Full Migration and enjoy your updated Woo store in a couple of hours. Happy Upgrading! 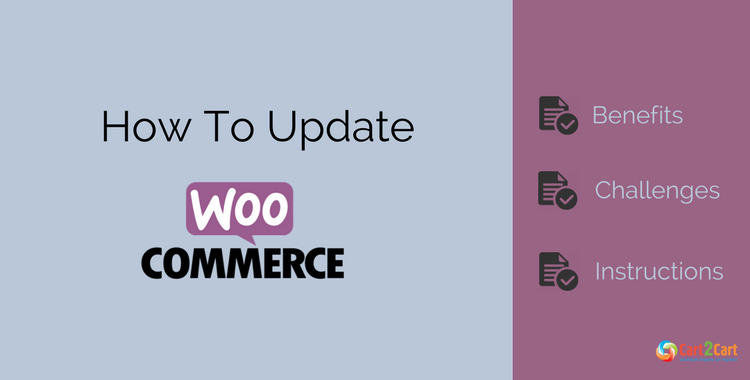 Now you know how the recent WooCommerce version will benefit your business, what issues you should take into account while performing the upgrade and how to update WooCommerce with ease. If you plan to succeed with your e-store (in fact, who isn’t? ), upgrading is a step you can not avoid. It is no longer “nice to have” feature - it is an absolute “must” your company will face eventually. Cart2Cart will release you from all the upgrading hassle. How? Try Free Demo to find out. Any aspect left unclear? Leave a commentary and we’ll give you more details.